Tams for Women. 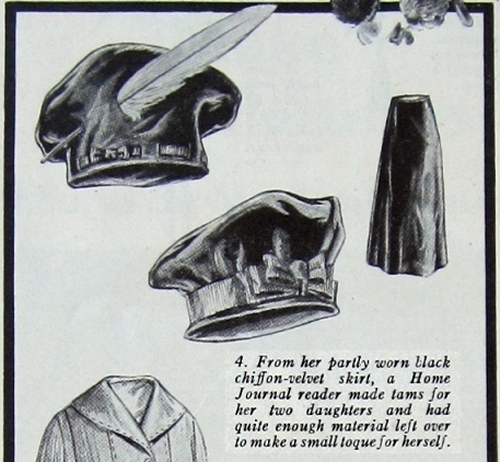 Ladies’ Home Journal, 1917; Delineator, Sept. 1917. 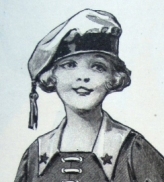 Tam o’ shanters have been popular hats for women at several periods, including the turn of the century . 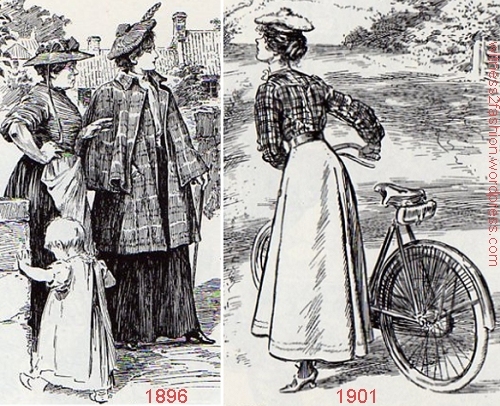 . .
Women in tams, as pictured in Punch Magazine, 1896 and 1901.
the World War I era . 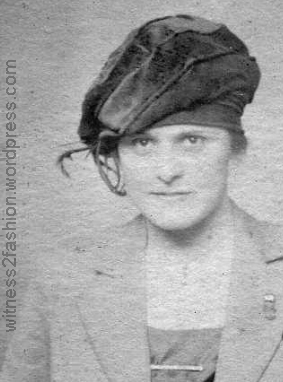 . .
Young woman in a fashionable velvet tam, about 1918. 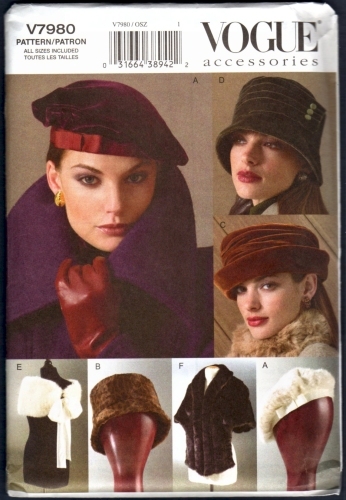 Tam “Beret” pattern, Vogue # 7980, 2004. The Tam-o’-Shanter (or Tam o’ Shanter) was originally a hat worn by Scottish men. 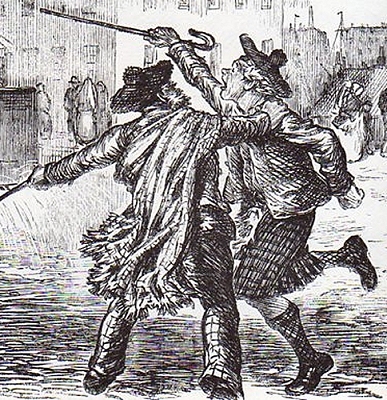 Two Scotsmen, as drawn by Charles Keene in Punch Magazine, 1880. With them it entered the military . 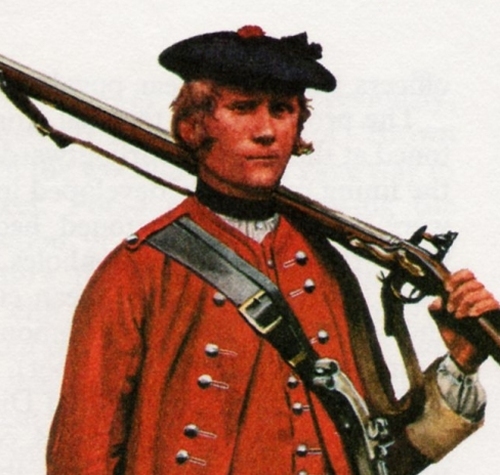 . .
A private in Crawford’s Highland Regiment, 1740, Illustrated by Pierre Turner. From Michael Barthrop’s British Infantry Uniforms Since 1660.
and became part of the official uniform of some regiments, like the Argyll and Sutherland Highlanders. In its simplest form, a tam is just a round or oval piece of cloth gathered into a band around the head. Some tams are made of two round pieces, or a round piece and a cylinder, stitched together around the circumference; the round hole in the lower piece can be eased into the band with or without gathering. This can produce a crisp look, as in this Vogue pattern illustration from 2004. 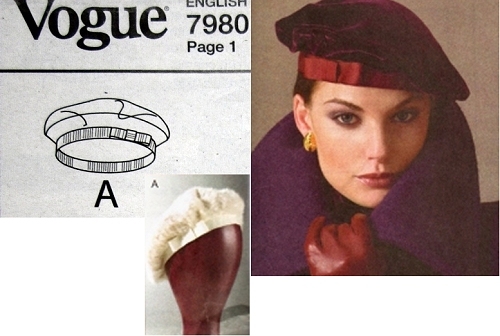 Vogue pattern 7980, dated 2004. 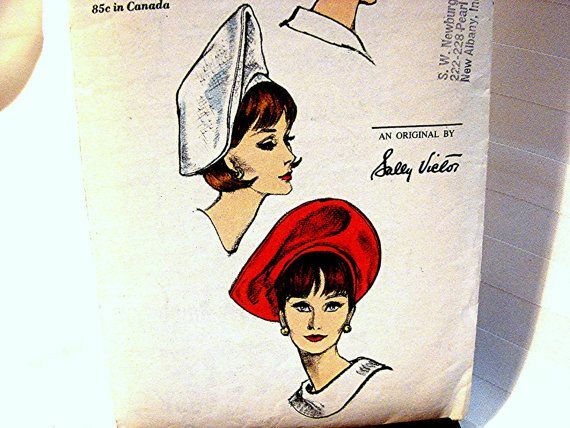 Vogue called this a beret in 2004; “tam-o-shanter” had disappeared from the current fashion vocabulary by then. 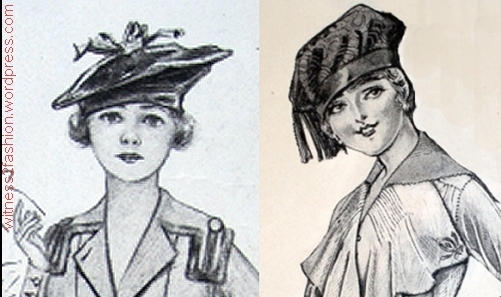 Today, you can find tams – some with a 1920s look – at hats.com, but they are classified as berets, not tam o’ shanters. 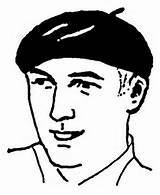 Sometimes the words “tam ” and “beret” are used interchangeably, but a beret usually has a very narrow binding around the head, and a relatively small crown. The tam o’ shanter usually has a wider band. 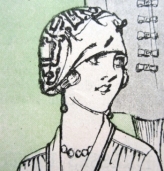 Also, the crown of a tam is much bigger than the band, and the tam is rarely symmetrical when worn by women; it tilts or droops to one side or to the back. Tam o’ shanter, 1925. Delineator. 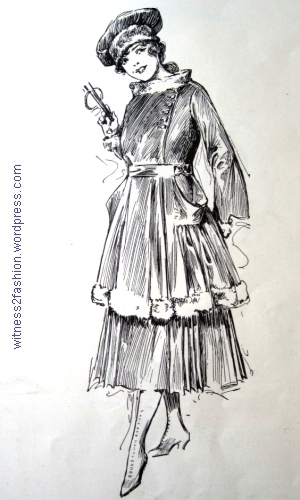 A chic Paris costume for ‘very young women” by Mme. 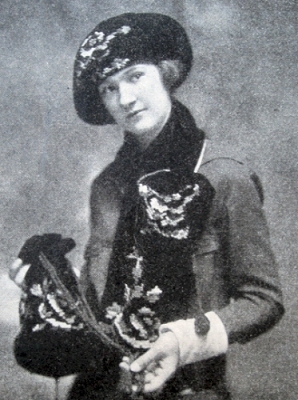 Paquin, 1917. Delineator. 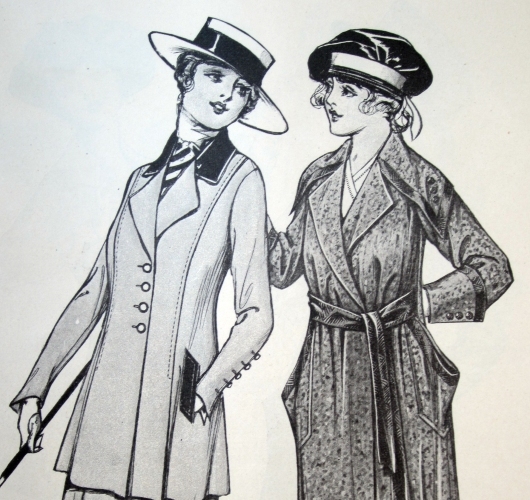 On the left, a tam worn with a coat pattern by Butterick, Sept. 1917. Delineator. 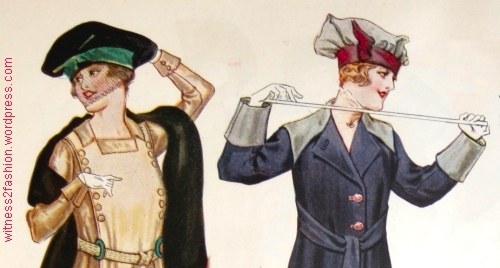 Women in tams (one is like a chef’s toque), Sept. 1917. Delineator. 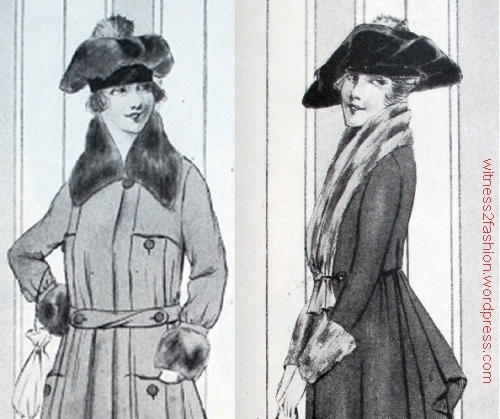 A tam made of fur and a tam made of fur or velvet; Ladies’ Home Journal, Nov. 1917. 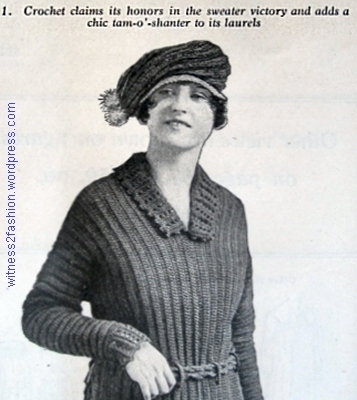 Delineator crochet patterns, Sept. 1917. Ad for Bear Brand Yarn, Ladies’ Home Journal, Oct. 1917. Ladies’ Home Journal, Sept. 1917. 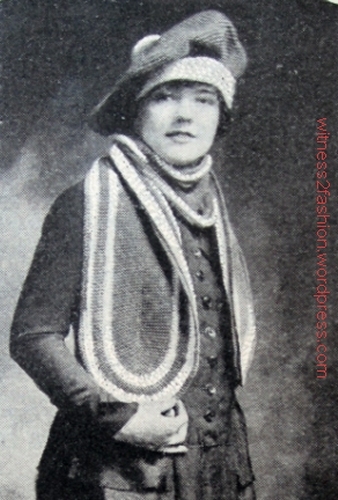 A knit tam could be rolled up and stuck in a pocket, which made them handy for wearing to school. 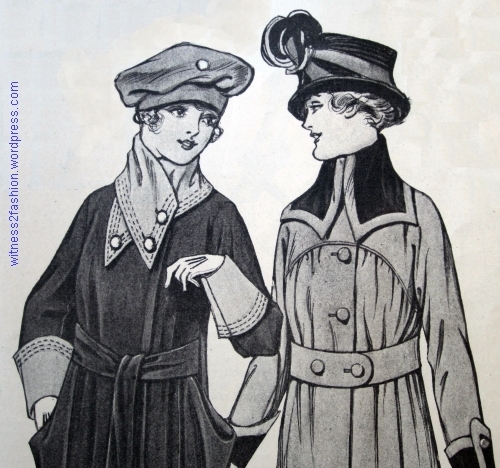 Perhaps the model on the right is explaining that her clever mother made this soft velvet hat from an old skirt.